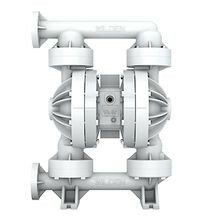 Wilden PS400 Advanced™ Series Pumps ensure maximum performance and efficiency. Their bolted configuration ensures total product containment while the engineered liquid path reduces internal friction to maximize output and efficiency. Available wetted path materials are polypropylene and PVDF.